Scrub potatoes with vegetable brush under cold running water. Cut into 2-inch chunks (do not peel). Place potatoes in large saucepan and add cold water to cover completely. Heat to boiling, then reduce heat to simmer. Cover and cook until potatoes are just tender, about 10 minutes. Drain and set aside in large mixing bowl. In large skillet, over medium-high heat, sauté pancetta until crisp. Lift pancetta out and set aside. Add onion to skillet and cook, stirring occasionally, until translucent. 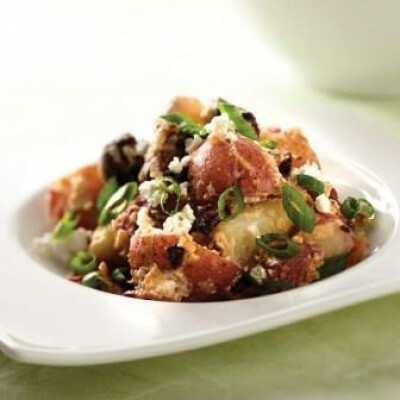 Stir onion, figs, half the goat cheese, vinegar, sugar, salt and pepper into potato/onion mixture and toss to mix well. Cover and chill for at least 45 minutes.